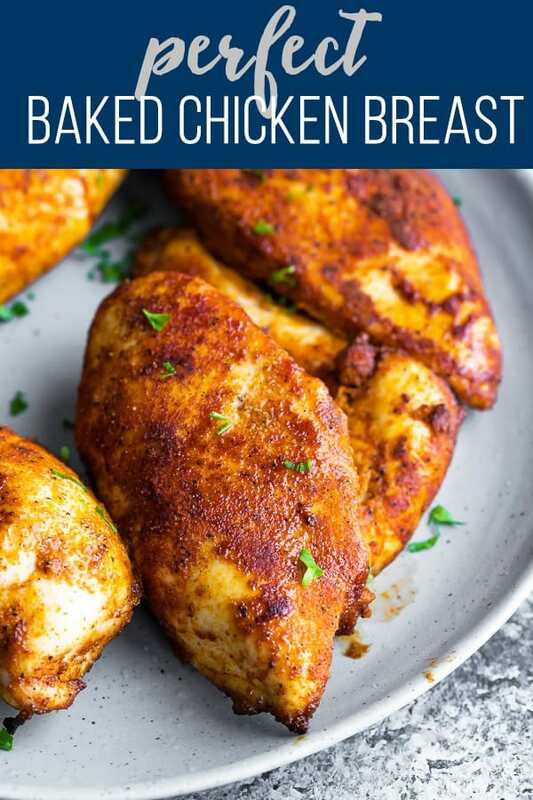 Perfect baked chicken breast- this post shows exactly how to bake chicken breasts to tender, juicy perfection! Delicious served as is or using up in your weekly meal prep. 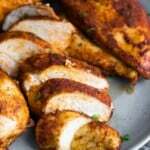 I have a LOT of chicken breast recipes on my site, and have used my same method to bake them for years. 425°F for 25-30 minutes, flipping half way. But I started to question…is this really the best way to cook chicken breasts? Is there another method to get juicier, more tender chicken breasts? So I started playing around. Psst! Find my Perfect Baked Chicken Thighs recipe here! And what I found? Cooking the chicken breasts at a higher temperature for less time is the key to juicy chicken breasts. All that other stuff is great too, but is much more effort than I’m willing to put into dinner. If you want the easiest way to cook juicy chicken breasts? This is it! Let’s discuss the important principles in how to cook the perfect oven baked chicken breast. 1. What temperature to bake chicken breast? Google ‘what temperature to bake chicken breast’ and you are going to get a LOT of different answers. And the scientist in me was curious, so I decided to test it out for myself! In the course of my experiments, I tried three different temperatures. 400°F, 425°F and 450°F. By far, 450°F produced the juiciest chicken breast! It could be that cooking at such a high temperature ‘sears’ the chicken to keep the juices inside, or it could be that the chicken breast bakes in the oven for less time, resulting in less loss of moisture. Whatever the reason, the chicken breast was noticeably more juicy when baked at 450°F. Now I think we all know, not all chicken breasts are the same. In fact, you could have a variety of chicken breast sizes in one package from the grocery store! 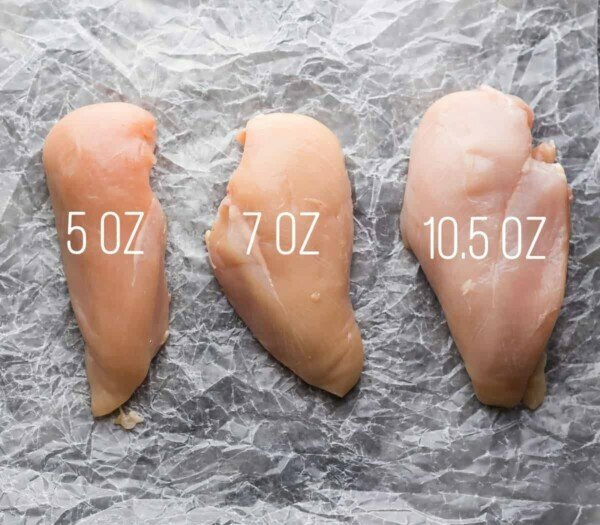 The best way to know how long to cook your chicken breast is to weigh it, then cook according to the chart below. Let’s just agree that this chart is an estimate! Please use your best judgment to determine if your baked chicken breast is cooked through. One way I test is to touch the middle of the breast with my finger. If it is still really wobbly, it’s not cooked through. If it is firm and springy, it may be cooked through. 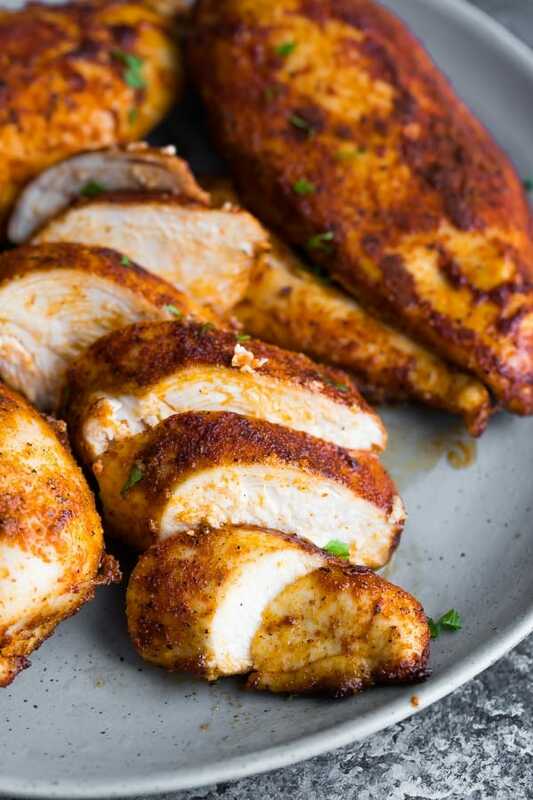 You can also test if your baked chicken breast is cooked through by using an oven thermometer, checking that it has reached an internal temperature of 165°F. Another hugely important factor in getting perfect, juicy oven baked chicken breasts is to rest them. I’ve always rested uncovered for 5-10 minutes, but I decided to try covering while they rested, and this was really beneficial in maintaining juicy chicken breasts! Here’s how to avoid wasteful aluminum foil while resting your chicken breasts: cover with a baking pan! 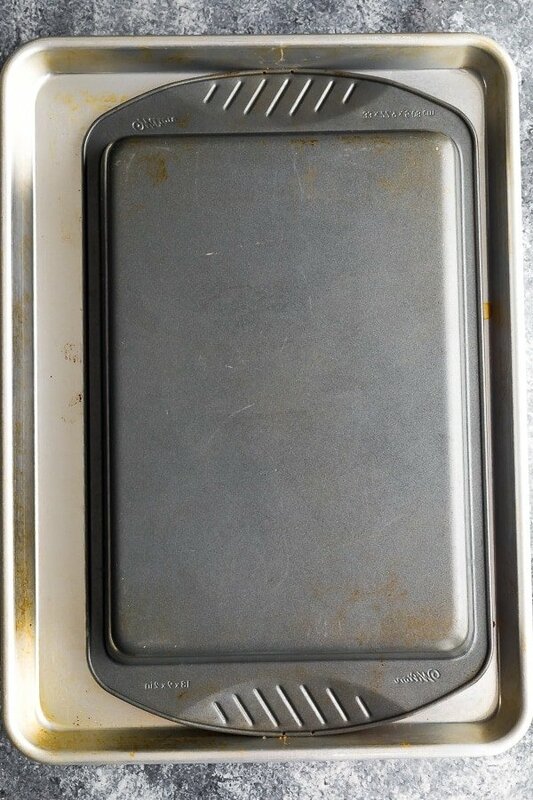 I used my 9 x 13 baking pan which easily covered the four large chicken breasts pictured here. 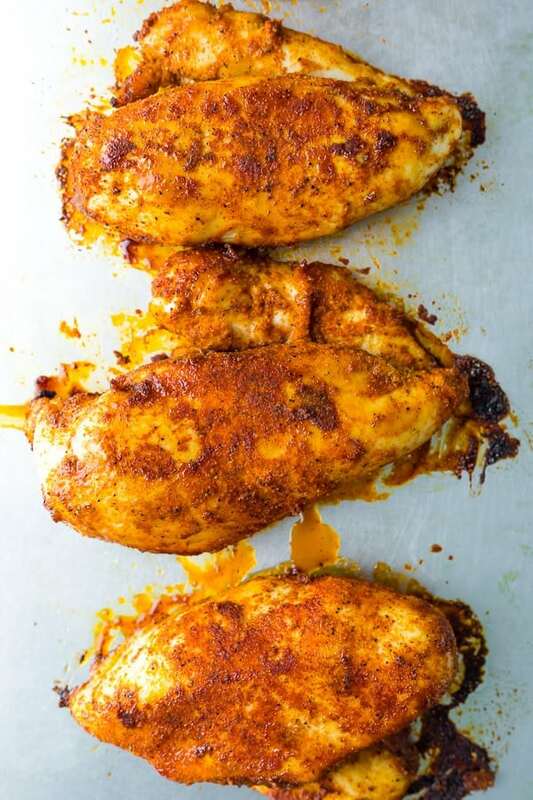 Resting baked chicken breasts is important because it allows the juices to settle. If you try to cut them right away, all that juice is going to run right out of the chicken breasts and you will end up with dry dry dry. Slicing baked chicken breast against the grain is another important tip in getting perfect, juicy baked chicken breasts. You will know right away if you’ve sliced with the grain, as your chicken breast will be stringy and gnarly looking, rather than smooth. Now admittedly it can sometimes be a little tricky to tell where the grain lies in your chicken breast, especially with a thick rub that covers the surface of the chicken. I look for the small end of the chicken breast and start there (pictured above! ), cutting on an angle across it, then keep slicing on the same direction all the way along the chicken breast. After after doing this a few times you will be able to tell where it is and slice like a pro! 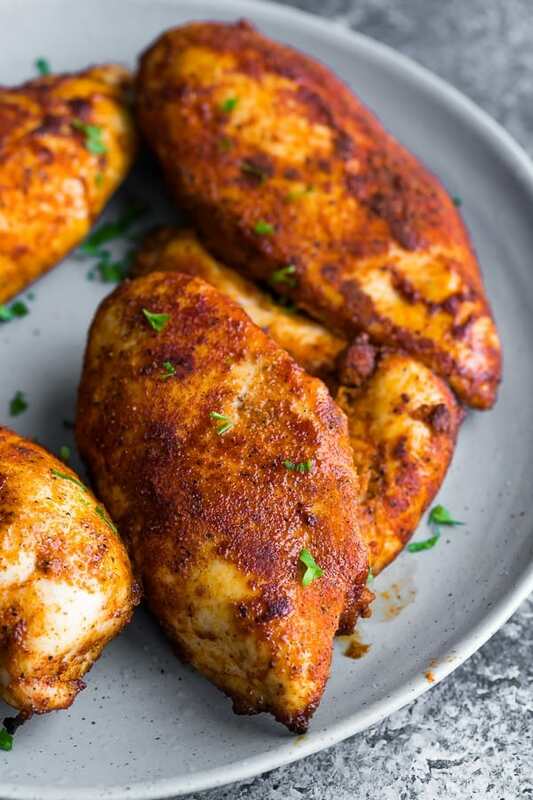 MEAL PREP TIP- if you are going to use this baked chicken breast later in the week, slice it after refrigerating overnight…it will retain so much moisture! What other seasonings can I use on my baked chicken breast? 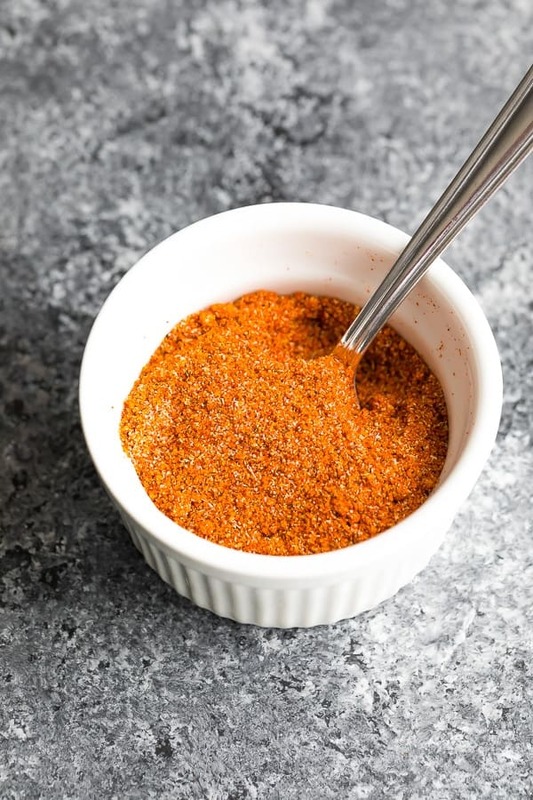 Try one of these 7 Easy Dry Rub Recipes! What goes well with these oven baked chicken breasts? I have a ton of ideas for you! Looking for more chicken breast recipes? Baked chicken breast may be stored in the fridge for up to 4 days, or in the freezer for 1 month.